Pollyanna Theatre Company production, Austin, TX. 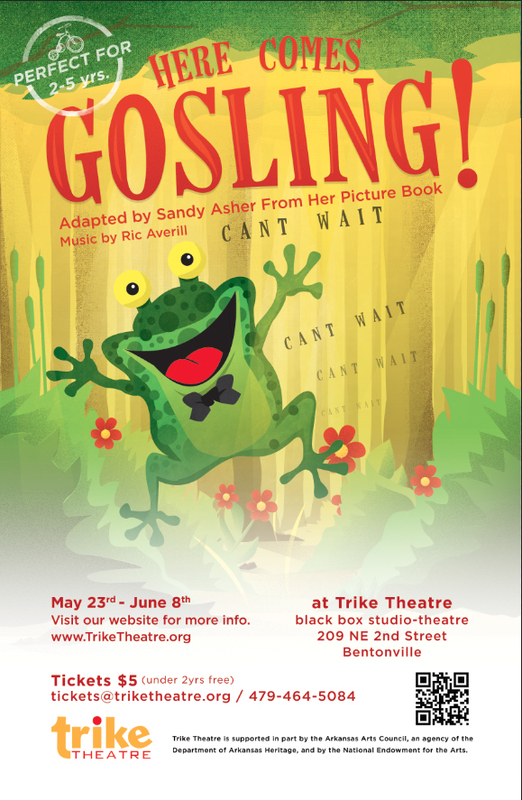 Based on my picture book about Froggie’s meeting with new baby Gosling and how mutual dismay turns into affection, this script with songs and optional music by Ric Averill is available in both a full immersion and a traditional version. The full immersion script was developed with Eastern Michigan University’s Theatre of the Young in cooperation with area Head Start classes and debuted in Ypsilanti. It was directed by Patricia Zimmer. 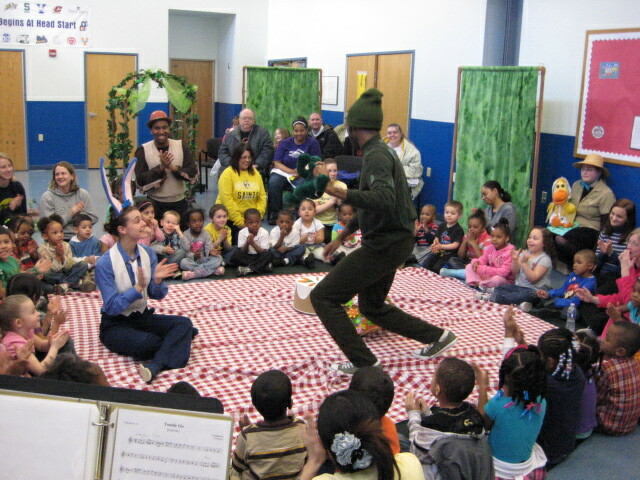 Here Froggie dances at the picnic while Rabbit, Gosling, and the Head Start kids look on. 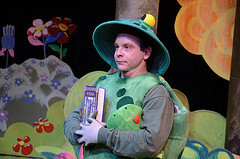 Pollyanna Theatre Company premiered the traditional version, directed by Judy Matetzschk-Campbell. Here’s an emotional family moment from that production with Goose, Gander, and a bigger-than-life Gosling. 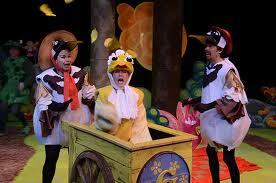 Second full-immersion production at Trike Theatre, Bentonville, Arkansas, May – June, 2014. Megan James, director. NOTE: HELPERS are needed only for full-immersion performances. Also, GOSLING is usually a hand-held puppet, but in the Pollyanna Theatre production, she was played by an actor, as shown in the photo above. HELPERS (for interactive version only), two or more as needed, friendly, soft-spoken, dressed in a way that distinguishes them from the characters in the play while not competing for the audience’s attention. Think “Mr. Rogers,” calm, casual, confident. HELPERS may also serve as musicians and/or be doublecast as GOOSE, GANDER, and the puppet GOSLING. IMPORTANT: In the full-immersion play, the children are encouraged to enter the world of the story and be involved in it through their imaginations and their senses. The difference between “full-immersion” and “participation” theater can be subtle, but to this playwright’s mind, participation theater involves the children in meeting specific needs of the story while full-immersion theater uses the story to meet developmental needs of the children. The needs being addressed by the latter center on exploring their imaginations and their sensory environment in a community setting. For example, in this case, the picnic blanket raising and lowering activity is not about getting the blanket positioned correctly with the children’s help in order to advance the plot. It’s about a theatrical context in which a group of children experience together the delightful lift and fall of the blanket. Ideally, a balance is constantly maintained between allowing the children time to enter the world of the story, explore it, and experience it as fully as possible and still keeping up the pace and professionalism of a satisfying theatrical performance. PLACE: An imaginary forest where rabbits, frogs, and geese talk, bake carrot cake, and change diapers. RUNNING TIME: about 1 hour, including preshow for the full-immersion script; about 35 minutes for the traditional script..
SUMMARY: Froggie and Rabbit eagerly prepare for the arrival of guests — Goose, Gander, and especially new baby Gosling. Froggie can hardly wait to meet her! But babies rarely respond as anticipated. Froggie’s enthusiastic greeting inspires horrendous honks of discontent. Froggie retreats, discouraged, while the others try in vain to placate Gosling. Now Froggie is perfectly content to wait as long as the honking persists. While he waits, he hums . . . and then sings . . . and then dances. A captivated Gosling stops her honking to watch, and their friendship begins. The visit continues happily with a picnic, refreshments, a game, a story, and, at last, a lullaby.